"With Complete Plans and Instructions for a Dinghy, a Canoe and a Kayak You Can Build"
Petrel, a high performance sea kayak. 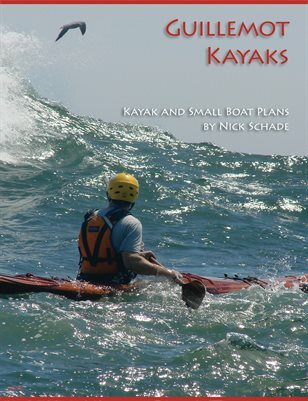 Complete offset tables are included for each of these boats so readers can loft full sized plans and build the boats using the book as instruction. Advanced techniques for building small boats using the strip-plank technique will help any boatbuilder who wishes to make their own small wooden boat of any design. This book includes methods for milling cove and bead strips, or carefully hand-fitting square-edge strips. It discusses the benefits of using staples to temporarily clamp strips in place, and provides efficient methods for avoiding staples altogether. The book discusses methods for applying color to the strips with stain and creating beautiful symmetry through book-matching strips. Beginning boatbuilders will find useful techniques to get them started with strip-planking and experienced builders should find techniques to make there work better or more efficient. Even craftsmen who have no intention of ever building a boat will learn methods for creating strong, free-form shapes by laminating narrow, thin, strips of wood and encapsulating them in weatherproof fiberglass and epoxy.